I’ve seen Stranger Lover Dreamer, the choreographic collective of Andrew Merrell, Elizebeth Randall Rains and Shaunna Vella, twice before. Once, as part of an ever popular San Francisco dance salon and once, presenting their own evening-length, mobile, site-specific work at Shawl-Anderson Dance Center in Berkeley. This past weekend, the dancemaking trio returned with another theatrical experience, this time, a shared quintuple bill of marvelous contemporary performance. The first and last pieces were co-choreographed, while the middle three gave the audience a chance to experience each individual artistic voice. Opening the evening was #3 Modern Dance Things, which couldn’t have had a better title. The work mined the breadth of the contemporary genre, from its pure physical syntax to choreographic devices to the conventions and norms of the studio, both those that exist for safety as well as those that actually propagate harm. With the entire company onstage (I didn’t count, but looked to be around twenty), Merrell, Rains and Vella began working through a single movement phrase. Rather than being pulled to exact replication, they experienced it in their distinct bodies, and on their own time. Quickly they took the phrase into the space, all the dancers joining in the dialogue. Adding more steps, they played with accumulation; the movement growing in scope. They played with time – experimenting with unison as well as staggering the choreography with a canon/wave effect. The result was a broad physical opera - bodies punctuating the stage in glorious energy; jumps and buoyant arms flying through the space with abandon. As striking as that was, #3 Modern Dance Things riveted most in its nods to class. You could see the dancers toggling between turn out and parallel, stretching, warming up, trying to feel and sense what their body needed in order to be prepared and ready for the tasks ahead. There were sequences plucked straight out of the studio – spotting practice, a grand battement series front, side and back. Anyone who has ever taken contemporary or jazz dance would immediately recognize that exercise. And there was a brief but powerful statement on gender - how that even contemporary dance, with its forward thinking, inclusive spirit, still has a long history of embedded gender binary within the studio space. Rains stood in a circle with seven dancers for the beginning of her #4 Remembering, Becoming. Together the group cycled through a tactile body percussion phrase, and as that concluded, the circle unfolded leaving Rains in front of the ensemble. She started a new set of arm, head and upper body motions – a gestural essay with ideas of swimming, sleeping and pointing. A few at a time, the cast would appropriate her movements. Eventually Rains exited the space, and the dancers continued with these initial cues, expanding them into full body choreography. They were not necessarily trying to accomplish the same gesture but instead, take Rains’ information and adjust it to their own reality – keeping what was helpful and discarding what didn’t speak to them. I had read that #4 Remembering Becoming had a strong connection to the idea of being a parent, more specifically, to being a mother. But I think that the incisiveness of the work is that there was an egalitarianism to its notion of sharing experiences, sharing wisdom as well as sharing frustration, hopes and fears. Those who aren’t parents (like myself), could certainly connect with these themes of passing down, of lineage, of community. 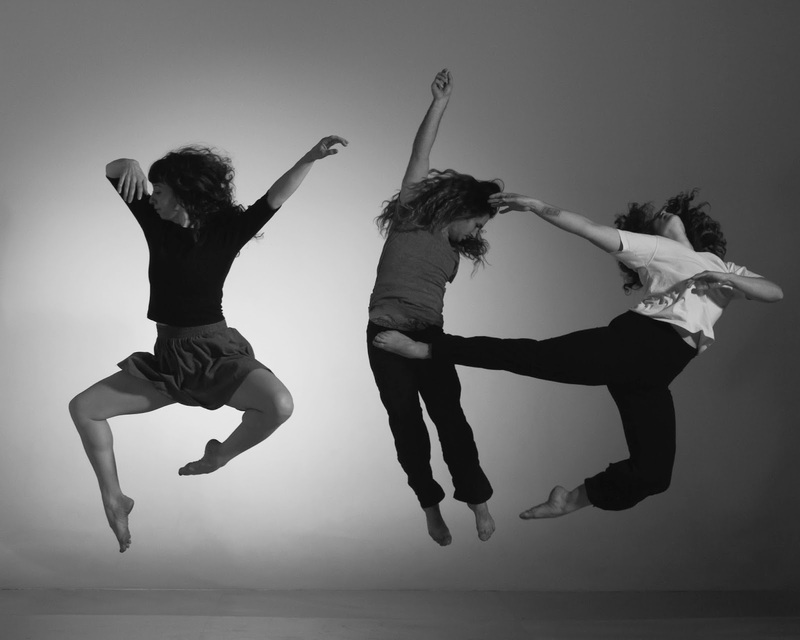 For a long time, I tried to discern the intent of any Dance Theater piece that I saw. But with the genre’s combination of movement, deconstructed non-linear narrative, repetition, multiple disciplines, purposeful absurdity and sometimes dark humor, more often than not, I left the theater totally confused. But then I shifted my strategy. Instead of attempting to figure out what the piece was about, instead I decided to simply notice what themes resonated with me. Maybe they lined up with the composition’s intent, maybe not, and I think that’s just fine. Merrell’s #5 Kiss Me While I Sleep was all Dance Theater. Performed by Sarah Chenoweth, Tara McArthur, Danny Nguyen and Mechelle Tunstall, the work deliciously oscillated realms. From a hot pink bedroom furniture scene where ‘how people share space’ was microscopically and hilariously distilled to full velocity choreographic segments to gender-bending enchainements to a range of props (bubble guns, lollipops, squirt bottles), #5 Kiss Me While I Sleep was a theatrical feast to be sure. And it ended with Rosemary Clooney’s cabaret scene from the one of my all-time favorite movies, the 1954 classic White Christmas. Through a hot-pink frame, Tunstall lip-synced “Love – You Didn’t Do Right By Me”, while Chenoweth, McArthur and Nguyen recreated mid-century modern choreography from the film, complete with its angular arms and geometric shapes. So what was my takeaway from this creative wonderland? One strong narrative throughline for me was Merrell’s exploration around perception and reality, not just their oft-oppositional nature, but also the porous space between the two. Next up was Vella’s #6 Living Swans, an ensemble dance for six. A tree placed upstage right immediate gave a natural/holistic vibe to the space. Simple arm movements and complex full body phrases filled the room, the dancers engaging with each other from beginning to end. And I use that word engage purposely. As one dancer would complete a step, they would gently tag another individual, like they were passing the physicality amongst the group. But as the work continued, it was clear that the tagging wasn’t a way of saying ‘take over my movement’ but a way of asking ‘how would you interpret this idea?’ #6 Living Swans was a comment on process, the continuation of process and how one individual’s process might affect and contribute to another’s journey. 3, 4, 5, 6, 1 closed with #1 Wishbone Home, The Remix (2014), a quartet by Rogelio Lopez, Merrell, Rains and Vella. An earlier version of this piece is what I had seen back in the summer of 2013 at RAWdance’s fourteenth CONCEPT Series. I took a look back at my thoughts, and at that time, had noted a sense of ritual and vastness. But I didn’t mention any humor or comedy, which is definitely what transpired on Saturday night. Pairing full Baroque silken skirts with vintage concert T-shirts, the four treated the audience to a campy send up on all things courtly and edgy. It was a joy to witness contemporary performance residing in a place of fun and farce, something that feels pretty rare these days.